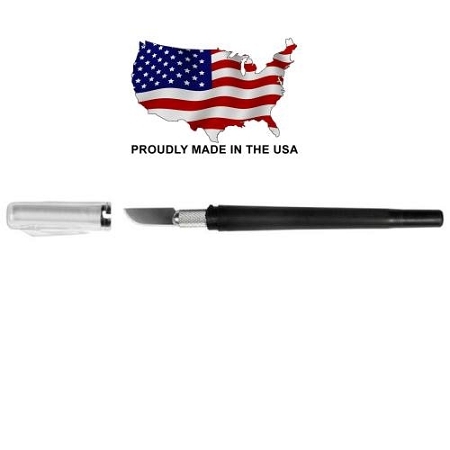 Light duty pen knife with machined aluminum chuck for secure blade positioning. Super sharp #10 blade with twist on plastic safety cap. Safety cap has a pocket clip for safe easy accessibility. Used for precision cutting and trimming. Measures 7/16â€� Diam. X 4-3/4â€�L. The #3 Pen Knife will accept any of the following blades: #10 Curved Edge Blade (21010-5pk/tubed), #11 Doublr Honed Blade (21011-5pk/tubed), #16 Stencil Edge Blade (21016-5pk/tubed) and the #17 Small Chisel Blade (21017-5pk/tubed). We show our most popular blades, if you're using something you don't see please call. 603-437-4651! All Blades are also available in bulk!